Our luxurious collection of faux wood venetian blinds is hardwearing, waterproof and looks fabulous! With a wide range of stylish colours and textures including taped options to choose from, finding the ideal look for your home has never been easier. They’re perfect if you want the beauty of natural wood along with all the practicality of faux wood and as they’re manufactured using a high grade PVC, they’re great for hot and humid bathrooms and kitchens. Our stylish collection of faux wood venetian blinds allows you to bring the beauty of real wood to your homes décor along with all the practicality of faux wood. Choose from sophisticated wood grains in rich oak, natural oak, walnut, ebony and grey as well as some very chic smooth contemporary finishes. They come in both 35mm and 50mm wide slats and are available in extra wide widths (up to 260cm) and extra-long drops (up to 300cm), so they’re perfect for big windows too. They are great at repelling water, dirt, grease and steam. They excel in the toughest of places; from messy kitchens to steamy bathrooms, they’re simply super practical. Functional too, they allow you to precisely control the amount of sunlight and privacy you require at the windows. Faux woods are a great alternative to real wood. They look as good as the real thing, especially with our gorgeous range of fine grain textures. Their main benefits over real wood come from the fact they are manufactured from extremely robust PVC which means they’re a breeze to clean, simply wipe them with a damp cloth. They’re also UV resistant, fire retardant and waterproof, making them ideally suited to areas of high humidity and moisture such as the bathroom, kitchen or shower room. 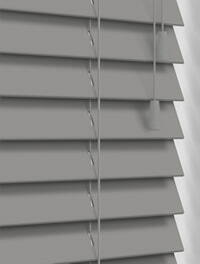 Note: Our made to measure faux wood blinds are not to be confused with cheap readymade plastic blinds, they are manufacturing using only high grade PVC and components throughout. They’re as tough as old boots, the slats won’t warp or bend. 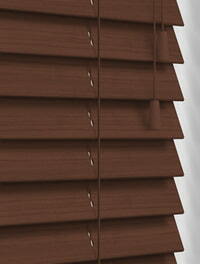 So you can rest assured you’re buying a high quality blind that is built to stand the test of time.